So you’re looking to combine this with something that can lock itself after attacking, so your Messiah G Unit can unlock the whole column fro another attack. Apart from that it can allow a 12k attacker to kiss 16k for another 5k guard needed, but apart from Metallia that isn’t a lot. The soulblast cost is a bit of a letdown as Alter Ego (both of them) need soul to draw more, but given he doesn’t grant an entire stage of power, you can just leave it when you don’t need it, or just recoup the soul back with Lady Fencer. 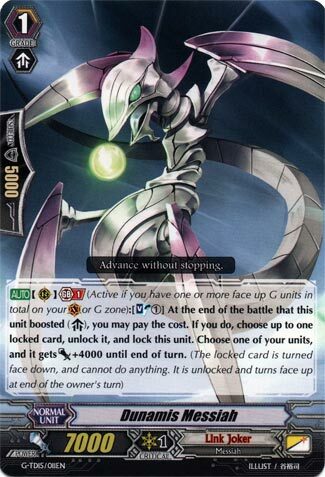 Incurring any extra soul costs in Link Joker decks does tend to hurt, but this card can extend your multi-attack combos, locking itself to unlock something that can flip itself back down in preparation for your Vanguard’s attack. It’s up to you whether that’s worth a Soul Blast or not.